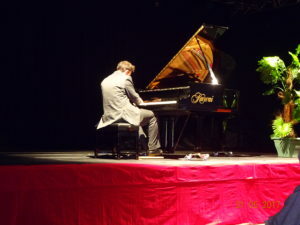 The Arcades Association was created 20 years ago, with the aim of spreading culture in the region around Le Buisson de Cadouin.For a long time, it organized a small number of events each year in the different villages of this area and in various forms: classical, jazz, theatre, painting, Japanese culture etc. In early 2014, the Cultural Animation Center (le Pôle d’Animation Culturelle) was commissioned, providing a large hall and stage equipped with modern technical equipment and excellent acoustics, enabling the development of the musical programmes that we offer now. 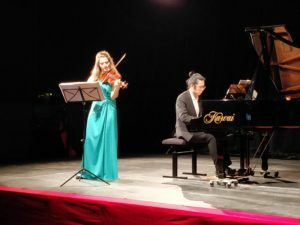 Taking into account all the musical events held in the surrounding villages, and in particular the almost total absence of classical music concerts outside the summer, the current members of the Arcades committee decided to set up a series of classical concerts from September to June. Over the years, we have developed a network of relations with very high-level musicians from France, Great Britain, Russia, Italy, Holland, etc, which allows us to stage about fifteen events in this venue each year. 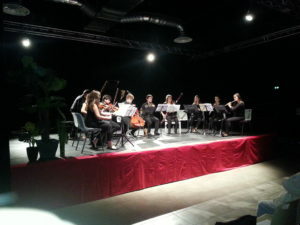 The reputation for quality that we have developed and maintained has led to requests from many artists who wish to come to Le Buisson de Cadouin and has led to a programme schedule which now extends two years into the future. Arcades is actively supported by the Department and the Community of Communes Bastides-Dordogne-Périgord for our cultural activity in rural areas. Arcades partners with the associations ACIP and La Tulipe, thus bringing together the French, English and Dutch communities living in Dordogne. Arcades and the Cultural Animation Center therefore function as a cultural center devoted to classical music, and supported entirely by the dedicated work of volunteers. Our audience comes from many parts of the Dordogne and neighbouring departments and some of them travel an hour to come to our concerts. Recently, Arcades was invited to become a partner of the International French violin competition “Long, Thibaud, Crespin”, which gives us the opportunity of being able to bring to Le Buisson a 2018 competition winner. “A little message to thank you for this beautiful weekend of exchanges that you have allowed us to live! We have received a lot and fully benefited from the energy conveyed by each member of the Arcades association! Florent and I will therefore keep a wonderful memory of this experience, and the attention that each of you have had with us! Don’t forget to also talk to spyware for phones your kids about twitter.